Какими музыкальными сервисам вы пользуетесь? Если честно, я думал, что the Cure запихнули в инди, чтобы их чаще выдавало в поиске, но в описании группы на сайте тоже упоминается "indie guitar bands". Я не силен в музыкальной истории, но разве в 80ых был такой термин? 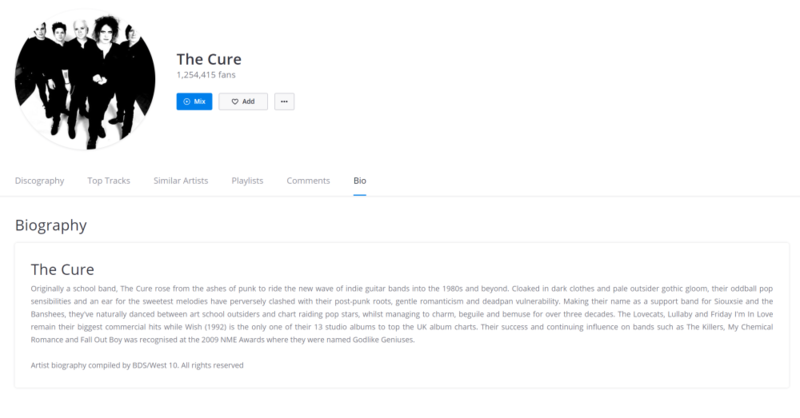 Originally a school band, The Cure rose from the ashes of punk to ride the new wave of indie guitar bands into the 1980s and beyond. Cloaked in dark clothes and pale outsider gothic gloom, their oddball pop sensibilities and an ear for the sweetest melodies have perversely clashed with their post-punk roots, gentle romanticism and deadpan vulnerability. Making their name as a support band for Siouxsie and the Banshees, they've naturally danced between art school outsiders and chart raiding pop stars, whilst managing to charm, beguile and bemuse for over three decades. The Lovecats, Lullaby and Friday I'm In Love remain their biggest commercial hits while Wish (1992) is the only one of their 13 studio albums to top the UK album charts. Their success and continuing influence on bands such as The Killers, My Chemical Romance and Fall Out Boy was recognised at the 2009 NME Awards where they were named Godlike Geniuses. Слушал их в начале 90-х, тогда они считались инди. Так же как и Dead Can Dance или Joy Division. А термин инди-музыка узнал из жжурнала "Экзотика" в 1992.